Make These Healthy Holiday Side Dish Swaps & Save Cals! Today’s post and recipes are created by core performance guru, Linda LaRue. Linda is the creator of Crunchless Abs and the new, constant resistance, 3-dimensional workout, The CORE TRANSFORMER, which burns nearly 1,000 calories per hour. Enjoy the healthy holiday side dish swaps! A bite here and a taste there may not seem like much during Thanksgiving dinner, but when it comes to holiday side dishes, those calories and fat can really add up! Here are my two favorite healthy holiday side-dish substitutes that won’t bust your waistline or budget. That’s because they’re low in calories and fat—especially saturated. And as they’re seasonal, they’re the most affordable, freshest, nutritious and best tasting—not to mention they have beautiful green and orange fall harvest colors, which will look magnificent on your holiday table! This is my favorite late harvest/winter vegetable to serve with any holiday meal, including Thanksgiving and Christmas. Drizzling a good quality aged balsamic vinegar adds sweetness and acidity, which will give this side dish a maximum flavor boost. Compare these Brussels sprouts, which have only 85 calories per cup and 5.3 grams of fat, versus the traditional green-bean casserole that has upwards of 275 calories per half cup serving and a whopping 20-plus grams of fat and more than 10 grams of saturated fat. Talk about healthy savings! 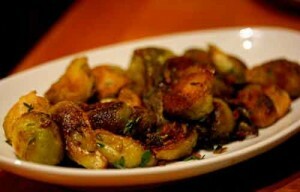 Place trimmed Brussels sprouts, olive oil, thyme, kosher salt and pepper in a large re-sealable plastic bag. Seal tightly, and shake to coat. Pour onto a baking sheet, and place on center oven rack. Roast in the preheated oven for 30 to 45 minutes, shaking pan every five to seven minutes for even browning. Reduce heat when necessary to prevent burning. Brussels sprouts should be dark brown, almost black, when done. Add kosher salt if necessary, and toss with 2 tbsp balsamic vinegar. Nutritional Content: Yields 6 Servings (about ¾ c each), each with 85 calories, 5 fat grams and 0 mg cholesterol. Roasting butternut squash is even easier than boiling and mashing them. Maple syrup glaze transforms this ultra-simple dish into a sublimely elegant harvest holiday side dish. And at only 60 calories per serving, it’s the ultimate waistline-trimming comfort food. This dish has 60 calories and 2 grams of fat per serving versus traditional mashed potatoes and gravy, which has 230 calories, 9 grams of fat and 5 grams of saturated fat. What a huge, gut-busting, calorie-saving improvement! Arrange butternut squash in an even layer in a 9-by-13-inch glass baking dish. Combine maple syrup, butter, lemon juice, salt and pepper in a small bowl. 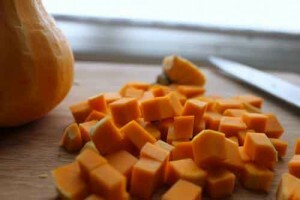 Pour the mixture over the butternut squash; toss to coat. Cover and bake the butternut squash for 15 minutes. Uncover, stir and cook, stirring every 15 minutes, until tender and starting to brown, 45 to 50 minutes more. Add more salt and pepper as necessary, serve and enjoy! Nutritional Content: Yields 12 half-cup servings with 60 calories a serving, 2 fat grams and just 5 mg of cholesterol.